At one time breeders and owners looked favorably on roly poly puppies. Chubby little puppies might be cute, but the science is inarguable: it’s not healthy for puppies to be fat. While it’s important for puppies to have a good birth weight and grow steadily during their first weeks of life, once the puppies are weaned and eating solid food, they are much better off if they stay on the lean side. Puppies that are allowed to become overweight or encouraged to grow too fast at a young age are more likely to have health problems as adults. Evidence indicates that they are more likely to be overweight as adult dogs and even have shorter lives. For this reason, it’s important not to overfeed puppies. 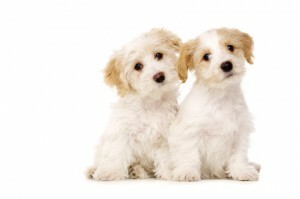 It’s also recommended that puppies eat a food that is especially formulated for puppies and not a food for adult dogs. Puppies have different vitamin and mineral requirements than adult dogs since they are going through a rapid growth period. Their bones, in particular, are growing fast. This is especially true for large breed puppies. If you have a large breed puppy you should make sure you feed a puppy food for large breed puppies. These puppy foods usually carefully balance the calcium to phosphorus ratio so large breed puppies won’t grow to rapidly. Rapid growth in large breed puppies can lead to musculo-skeletal problems later in life, but all owners need to be careful about feeding puppy foods that have the correct vitamin and mineral balances for puppies. As far as how much to feed your puppy, that will depend on several factors such as your puppy’s size, energy level, and how large the puppy will be when fully grown (if known). As far back as the early 1990s, the government began publishing research about dogs and cats and their nutrient requirements to act as a guideline for pet food manufacturers. 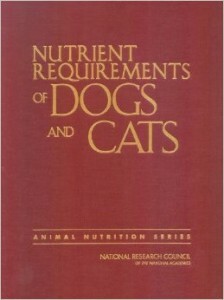 The National Research Council’s (NRC) book Nutrient Requirements of Dogs and Cats (Nutrient Requirements of Domestic Animals) is updated periodically. It contains the latest research on the nutritional requirements of dogs and cats at various growth stages. It’s a lengthy and detailed scientific look at how animals metabolize nutrients. The Association of American Feed Control Officials, which provides volunteer regulations for pet food labeling, also has nutritional guidelines for pet food manufacturers. They are in the process of updating their guidelines in 2014. The NRC and AAFCO are the sources used by pet food manufacturers to provide suggested feeding amounts on pet food labels based on how many calories per day a dog or puppy needs for his age, weight and activity level. RER means Resting Energy Requirement. The formula uses kilograms. The easiest way for most Americans to use the formula is to find your puppy or dog’s ideal weight in kilograms (you can ask your vet) and convert it to pounds by dividing it by 2.2. Then multiply that number by 30 and add 70. That will be your dog’s resting energy requirement for calories. For a puppy under 4 months old, multiply by 3 and you have the number of calories he should have per day. For a puppy more than 4 months old, multiply by 2 to find how many calories he should have per day. Remember, these are just guidelines and you will need to adjust them. It’s usually easier to follow the suggested feeding amounts on the pet food label since they do this math for you. You always need to check the food label to see how much food is recommended for your puppy and then adjust the amount based on your puppy’s condition. If he’s getting too fat, you should reduce the amount you’re feeding. If he’s too skinny, then increase the amount a little. Every puppy is an individual. Remember that puppy foods are different, too. Some foods will have more or less calories per cup than others. So, if you have been feeding your puppy a food with fewer calories and he’s been getting two cups per meal, you may need to cut back on how much you feed your puppy if you change to a food that has more calories per cup. The calories in the food should be listed either on the label or on the pet food manufacturer’s web site. And remember: no chubby puppies! Keep your puppy lean and fit and he’ll be healthier and live longer.